Turkish PM Davutoglu says gov't 'won't succumb to Jewish lobby' after Erdogan accuses opponents of cooperating with Mossad. Turkish Prime Minister Ahmet Davutoglu said Sunday that his government would not succumb to the Jewish lobby, the Armenian lobby, or the lobby of the Turkish-Greek minority. Speaking at the Justice and Development Party's provincial congress in Istanbul, Davutogolu stated, “I announce it from here: we have not and will not succumb to the Jewish lobby, the Armenian lobby or the Turkish-Greek minority’s lobbies." Davutoglu's comments come as a response to President Recep Tayyip Erdogan's accusation that Gulenists in Turkey are working in cooperation with Israel's intelligence organization, the Mossad. Gulenists, the supporters of US-based Islamic scholar Fethullah Gulen, have been dubbed "the parallel structure" by Erdogan. They are believed to be engaged in a political power struggle with the President, despite claiming to be non-political in nature. Erdogan has previously accused Gulenists of illegal wiretappings and a "coup attempt" following the corruption-related arrests of four former ministers and their sons, all allies of Erdogan. He alleges Gulen's supporters orchestrated the charges after the government shut down many of Gulen's private pre-university schools in Turkey in December of 2013. During a meeting of business leaders in Istanbul on Saturday, Erdogan attacked the Gulenists and called on their supporters to open their eyes. “The sincere people backing this parallel structure should see this structure is cooperating with … Shame on them if they still cannot see that this structure is cooperating with the Mossad,” Erdoğan charged. Both Erdogan and Davutoglu are known for their anti-Israel sentiments and statements. Erdogan recently blasted Netanyahu for "daring" to attend an anti-terror solidarity march in Paris after the attacks in that city. 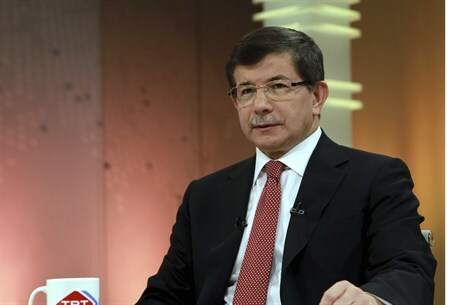 Davutoglu, followed suit, first claiming that Netanyahu had committed crimes against humanity and following that up by accusing him of terrorism. Turkey's Foreign Minister, Mevlut Cavusoglu, joined the act Friday, when he cancelled plans to attend the Munich Security Conference in protest at the inclusion of Israeli representatives in a session on the Middle East.